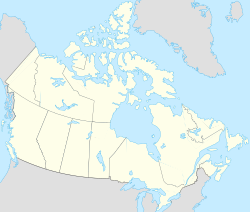 100 Mile House is a town and district municipality located in the South Cariboo region of central British Columbia, Canada. 100 Mile House was originally known as Bridge Creek House, named after the creek running through the area. Its origins as a settlement go back to the time when Thomas Miller owned a collection of ramshackle buildings serving the traffic of the gold rush as a resting point for travellers moving between Kamloops and Fort Alexandria, which was 98 miles (158 km) north of 100 Mile House farther along the HBC Brigade Trail. It acquired its current name during the Cariboo Gold Rush where a roadhouse was constructed in 1862 at the 100 miles (160 km) mark up the Old Cariboo Road from Lillooet. In 1930, Lord Martin Cecil left England to come to 100 Mile House and manage the estate owned by his father, the 5th Marquess of Exeter. The estate's train stop on the Pacific Great Eastern (now Canadian National Railway (CNR)) railway is to the west of town and called Exeter. The town, which at the time consisted of the roadhouse, a general store, a post office, telegraph office and a power plant, had a population of 12. The original road house burned down in 1937. 100 Mile House residents often go by the demonym BX'ers, in relation to Barnard's Express. 100 Mile House is on Secwepemc unceded territory. The nearest Secwepemc band is the Tsq'escen, for whom a geographic reference point is the Canim Lake Reserve. At present, 100 Mile House is the primary service centre for the South Cariboo and has a population of approximately 2,000. The service area has a population roughly ten times the size of the town. It includes the communities of Lac La Hache, Forest Grove, Lone Butte, Horse Lake, Bridge Lake, 70 Mile House, Canim Lake, and 108 Mile Ranch, and is the largest residential centre between Kamloops and Williams Lake. The primary industries of 100 Mile House are forestry and ranching. Log home building and tourism are also an important part of the community. 100 Mile House is a centre for outdoor activities and is becoming increasingly known for its richness of bird life. The surrounding area features hundreds of lakes for boating and fishing including 101 Mile Lake, 103 Mile Lake, Lac La Hache, Canim Lake, Horse Lake, Green Lake, Bridge Lake and Sheridan Lake. The Cariboo ski marathon attracts a large and international field of cross-country (Nordic) skiers. The surrounding communities have various activities for residents and visiting tourists, including rodeos and an extensive trail system. This area is known for outdoor activities including hiking, snowmobiling, cross country skiing, and ATV riding. There are government campgrounds at Green Lake, Bridge Lake and Lac La Hache. There are also many private campsites around the area that also offer cabin and fishing boat rentals and RV hook-ups. North of 100 Mile House is Lac La Hache (26 km), 150 Mile House (77 km), Williams Lake (91 km), and McLeese Lake (135 km). 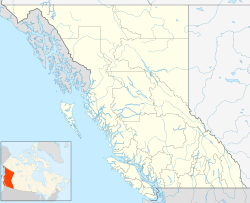 Also located north of 100 Mile House is Quesnel (210 km) and Prince George (329 km). South-East of 100 Mile House is the Interlakes area and Bridge Lake (56 km). South of the town is 70 Mile House (40 km), Clinton (72 km), Cache Creek (112 km), Spences Bridge (159 km), and Vancouver (456 km). 100 Mile House has a humid continental climate (Köppen Dfb) with mild summers combined with cool nights, along with cold, but not very cold winters for its latitude. In spite of the moderation that comes from its relative proximity to the Pacific Ocean, extreme winter temperatures can occasionally occur, with a record low of −48 °C (−54 °F). 100 Mile House is located in a rain shadow of the coastal mountains, resulting in reduced precipitation, much of it falling as snow. ^ BC Geographical Names entry "Exeter (locality)"
^ "Calculation Information for 1981 to 2010 Canadian Normals Data". Environment Canada. Archived from the original on 22 June 2013. Retrieved 9 July 2013. Wikivoyage has a travel guide for 100 Mile House. "100 Mile House (district municipality)". BC Geographical Names.